Posted on June 12, 2013 Posted in Elementary, High School, Middle School, My Products, Teachers Pay Teachers	. This Are You Smarter Than A 5th Grader? PowerPoint template can be used to review with your class before big tests and exams! I’ve included the instructions directly from the PowerPoint file below so that you can get an idea of how it works. Click here to check out this game template on Teachers Pay Teachers. 26 slides, includes basic animation and sound. 1. Come up with ten 11 different review questions (and answers) and rank them 1-11 by level of difficulty, where #1 is the easiest and #11 is the hardest. The hardest question (#11) will be the “$1,000,000 Question”, so, make it extra difficult! 2. Enter each respective question into the slides titled “Question 1”, “Question 2”, “Question 3”, etc. For example, your question #1 should go into the “Question 1” slide. Your #11 question should go into the “$1,000,000 Question” slide (slide 24). 3. Enter each respective answer into the slides titled “Answer 1”, “Answer 2”, “Answer 3”, etc. For example, your answer #1 should go into the “Answer 1” slide. Your #11 answer should go into the “$1,000,000 Answer” slide (slide 25). 4. Enter the topic for the “$1,000,000 Question” into slide 23. 5. Enter the game title or topic into slide 1. 6. You’re ready to play! 1. Have your students complete this game together! Pick 11 students and number them from one to eleven. Student one answers the first question, student two answers the second question, etc… You can also have your students play in pairs or small groups (depending on the size of your class). 2. Have the first player pick which question they’d like to answer and click on the appropriate button. This will take you to that question’s slide. Read your students the question and give the player 30 seconds to respond. When they answer the question, hit the “Proceed” button to go to the “Answer” slide and reveal the correct answer. 3. If the student is unsure of the answer when their 30 seconds have elapsed, they can use one of the “Cheats”. All you have to do is click on the “Use a Cheat!” button which takes you to the “Cheats” slide. From there, you can follow the instructions on using one of the cheats. 4. If the student has provided the correct answer on their own (or by using one of the cheats), return to the main screen by clicking on the “Return to Main” button on the “Answer” slides. Then, click on the $1,000 cash prize on the right-hand size of the screen. This will turn the amount white, which indicates that the player has earned it. As students continue to answer questions correctly, progressively click up toward the $1,000,000 cash prize. Each correct answer correlates to one click up the ladder. 5. Continue playing by having the next participant select a question. 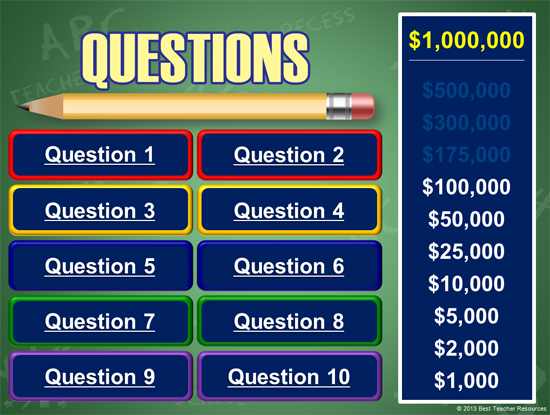 When all of the 10 available questions have been answered on the main screen (and your students have earned $500,000), click on the yellow “$1,000,000” text on the top right of the screen. This will take you to the “$1,000,000” topic screen. After hearing the topic, you can give the player the option to continue. I personally always make my students answer, but that’s how the game show is played! 6. Click “Proceed” to be taken to the “$1,000,000 Question”. Give the player 60 seconds to answer. They may not use any remaining cheats at this time. After the 60 seconds have elapsed, ask the player for their answer and then click “Proceed” to be taken to the “Answer” slide. 7. 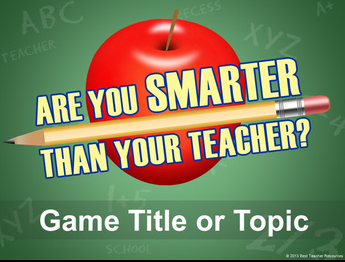 If the player answers correctly (and wins “Are You Smarter Than Your Teacher?”), consider giving your students extra credit or a “Free Homework” pass!